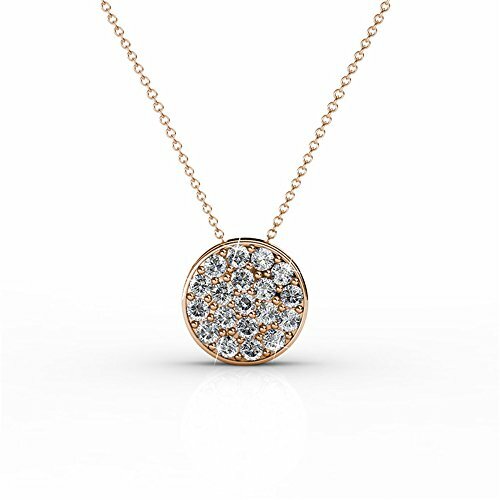 This beautiful Rose Gold Circle Necklace is a beautifully crafted with Swarovski Crystals that will enhance any wardrobe choice making it the perfect gift for that special someone! We Offer a 100% MONEY-BACK GUARANTEE, NO HASSLE RETURNS, & FREE SHIPPING ON EVERY ORDER. FASHION JEWELRY FOR WOMEN - This Circle pendant is the perfect way to add some subtle sparkle to your wardrobe and you don't have to spend a ton to look fabulous. How cool is that? It's so versatile you can pair it with a t-shirt and jeans on those casual weekends or with that little black dress you only wear for special occasions. Really, you can't have a better accessory on your fashion team. CHRISTMAS, GIFTS FOR WOMEN - Designed and created with the modern woman in mind. With the use of real Swarovski Elements and Crystal, it gives women the assurance that this is of excellent quality and will stand the test of time. A delicate and vintage- inspired necklace that is a true standard to any woman's accessory collection that can be easily be transitioned from day to night, and from the office to a date with that special someone. RISK FREE MONEY BACK GUARANTEE - DON'T LOVE YOUR PRODUCT? CONTACT US FOR A HASSLE FREE RETURN. Our #1 priority is a positive customer experience for you. Unlike many others in the industry, Cate and Chloe values our customers, and if you are not happy we will make sure your product is returned free of charge to you, along with a full refund. SILVER MOUNTAIN 925 Sterling Silver Mother and Child Horse Head Heart Shape Pendant Necklace with Cubic Zirconia,18"